Te-MagS includes moveable magnets for magnetic bead-based separation tasks, as well as an optional heating block for temperature-dependant lysis or elution steps. 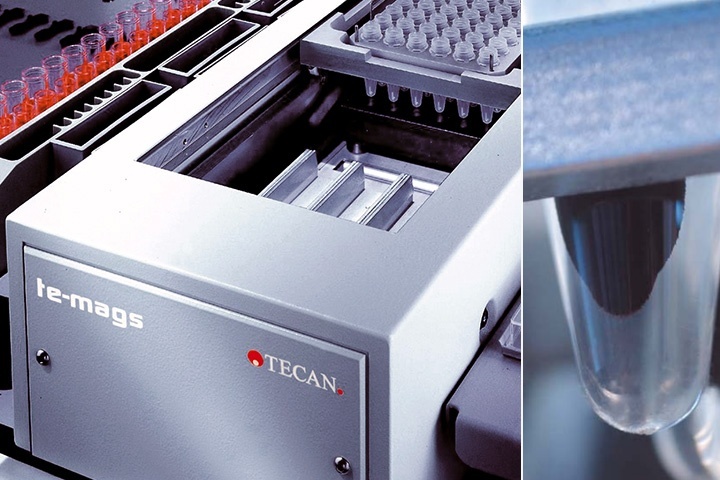 Straightforward software control for magnet movements and block heating is provided by Tecan’s pipetting software packages. The unique magnetic mixing function increases throughput and reduces disposable tip consumption. Automated exchange of tubes or plates on the Te-MagS allows multiple batch processes without user intervention. Variable positioning of magnetic beads improves yields and enhances flexibility. Typical applications include DNA/RNA, PCR products or protein purification, as well as cell isolation. Russia has been a fast-growing region for biotechnology and life sciences in recent years, with food and agriculture being key focus areas. Here is a snapshot from laboratories looking at the contrasting roles of microbiology in food production, both employing Tecan equipment in their workflows.